Anxiety is all too often a hidden cancer in our midst. Not the ordinary “Sure, I’m stressed, too” level of anxiety or worry or stress that everyone lives with – but the anxiety that destroys a person from the inside out, eating away at them, hollowing their lives, devastating their faith. 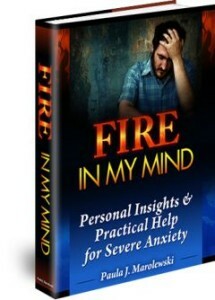 Fire in My Mind is a unique and deeply moving study on severe anxiety, providing personal insights, practical advice, and profound scriptural meditations on eight key aspects of anxiety: racing thoughts, fear, shame, irrationality, doubt, anger, exhaustion, and loneliness.